Wearing a knee brace following anterior cruciate ligament (ACL) surgery has no effect on a person's recovery. However, strength, range-of-motion, and functionality exercises provide significant benefits, and other new therapies may show promise. In a new literature review recently published in the Journal of Bone and Joint Surgery (JBJS), a team of orthopaedic surgeons reviewed 29 studies regarding treatment following reconstructive ACL surgery. They found that physical therapy, begun shortly after surgery, can bring about very good outcomes for patients. Bracing, though, did not seem to improve results. The ACL runs through the middle of the knee joint and helps to stabilize it. While the ACL can be injured through impact, it is most commonly strained or torn during non-contact injuries. ACL tears are a common injury for athletes who turn quickly, land hard, and otherwise stress their knees including basketball, tennis, soccer, and football players. However, anyone can tear their ACL doing something as mundane as falling off a curb. ACL injuries often require reconstructive surgery, with post-surgical rehabilitative therapy. These therapies usually focus on improving the patient's strength, range of motion, and function, and also may include some balance exercises. Other findings of this reviews are that, physiotherapy should begin early, ideally within a few days after surgery. Therapies focusing on proprioception (awareness of movement of one's body) may have benefits; however, the extent of their efficacy requires further research. 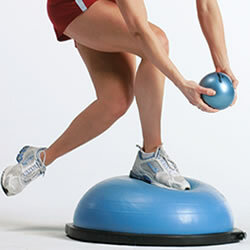 Balance therapies also may be promising. Neuromuscular therapies are not harmful, but their benefits are in doubt and require more study. Neuromuscular therapies should be used to support other physical therapies, not in place of them. Accelerated rehabilitation also does not appear to be harmful, but should be studied further. No vitamins or other supplements have been proven to have any effect on ACL healing. "The most important thing for ACL surgery patients is to start physical therapy early and rigorously," says Rick W. Wright, MD, professor and co-chief of the sports medicine department at the Washington University Department of Orthopaedic Surgery, St, Louis, Mo. "It can be difficult at first, but it's worth it in terms of returning to sports and other activities." n.p. (2012, October 11). "Physical Therapy, Not A Knee Brace, Aids In ACL Recovery." Medical News Today. Retrieved from http://www.medicalnewstoday.com/releases/251336.php.